California teenagers have shown they can handle de facto legal marijuana. The adults aren’t doing so well. Beginning January 1, 2011, California reduced the penalty for possession of less than one ounce of marijuana from a misdemeanor to a simple infraction, maximum fine $100, similar to jaywalking – for teenagers and adults alike. Arrests for marijuana possession plunged by 85% in the Golden State, and even infractions appear to be rare. The trends in crime and drug problems in California from 2010 through 2014 in the three years of essentially legal marijuana have been striking. 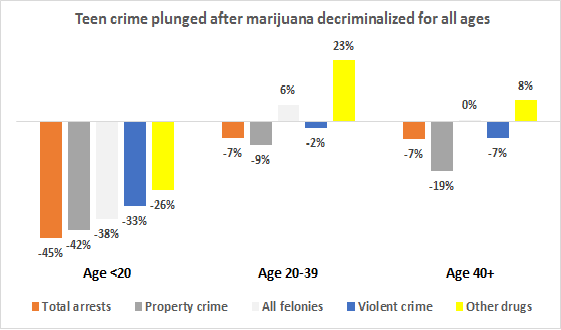 As teenage arrests for marijuana offenses (misdemeanor and felony) fell by 73%, other teenage crime has plunged as never before (down 26% for drugs other than marijuana, down 33% for violent crime, down 38% for all felonies, down 45% for all offenses). Violent deaths and deaths attributed to drug abuse also fell, the latter sharply, among teens. Change in crime rate, 2014 (latest year) vs. 2010 (year before marijuana decriminalized for all ages). Source: California Criminal Justice Statistics Center (2015). Change in death rate, 2013 (latest year) vs. 2010 (year before marijuana decriminalized for all ages). Source: Centers for Disease Control, WISQARS (2015). Lest you think trends like this must result from some statistical glitch – everyone “knows” the “teenage brain” can’t handle pot, and the only survey shows California teen pot smoking rose slightly after decriminalization – note that adult crime was being measured just fine in the pot decriminalization era: trends were mixed, with disturbing increases in arrests for drugs other than marijuana. 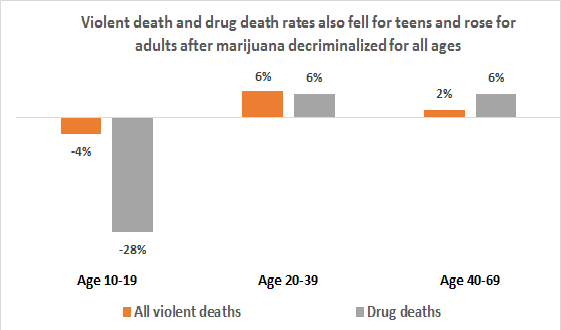 While most crime and death, even drug-related death, doesn’t involve marijuana, clearly, California teens as a class handled effectively legal weed more than responsibly. You’d think those trying to legalize marijuana in California would be shouting up the teenage crime plunge from the rooftops (it stunningly refutes Drug War stalwarts such as Joseph Califano’s dire predictions of youth run wild) and citing young people as a model for adults in handling legal marijuana responsibly. If you think anything of the sort, you don’t know Gavin Newsom and his demagoguery to legalize grownup highs by fanning fears of “children” smoking pot. It clear that protecting children and promoting public health must be paramount. A 2014 survey of 12th graders from the National Institute on Drug Abuse found that nearly half of those surveyed had used marijuana – significantly more than tobacco. That is the failure of the status quo: When we shirk marijuana use to illicit markets, drug dealers can continue selling marijuana to kids without IDs and targeting the youngest, most impressionable members of our communities. But legalizing recreational marijuana use for adults – if done right – would bring the industry out of the shadows and into a regulated mainstream with oversight to protect our children and promote public health and safety. …Legalizing marijuana gives us a new opportunity to provide better prevention and education programs, which would limit youth access to marijuana and keep California’s students in the classroom instead of tangled up in the criminal justice system. Know-nothing jingoism like this is why the United States remains such a dangerous society. Of all the lies marijuana legalizers tell about youth (drug warriors’ lies, the latest blaming teenagers for America’s prescription drug abuse crisis, are also appalling), let-us-grownups-get-high…for-the-children! is the most despicable. Newsom fails to mention that the same 2014 NIDA (actually, Monitoring the Future) survey he cites states right up front that more 12th graders used legal, regulated, mainstream alcohol in the past month than used illegal marijuana in the past year. In fact, every responsible survey over the last 40 years shows teens of all ages consistently saying alcohol and tobacco are much easier to get, particularly at younger ages, than marijuana. What happened here is appalling. The fact is that on an issue they themselves declared paramount, the Lieutenant Governor of California, the American Civil Liberties Union of Northern California, and their Blue Ribbon Commission on Marijuana Policy* collaborated in serious deception. How could these august individuals (see members below) and groups sign on to a policy document that so shamelessly exploited “protecting children” with primitive Tea-Party level fabrications? Exploiting children and youth is typical American interest-group sleaze. Newsom and allies’ campaign is about legalizing partying for their grownup peers, not protecting “children.” If he actually believed marijuana is some dire threat to “children,” he would be tackling the tough issues on their behalf, such as talking seriously about drug addiction and crime by the group suffering the fastest-growing troubles today (answer: Newsom’s own middle-aged demographic). He would be vigorously crusading for abstinence from marijuana (and alcohol, tobacco, and other drugs) by parents, whose drug use increases dangers to their children and vastly elevates the odds their kids will do likewise. Our analysis of federal traffic crash data published in the Journal of Studies on Alcohol and Drugs showed that every year, alcohol-impaired adult drivers of legal drinking age cause 250,000 crashes victimizing children and teenagers, killing 800 and injuring 80,000. Two university medical school studies found adult smokers cause the premature deaths of hundreds of children every year from secondhand smoke’s toxic effects and in fires. A 1986 Surgeon General’s review found adults’ secondhand tobacco smoke so damaging to the health of millions of children that it recommended banning smoking in children’s airspaces. Of course, adult marijuana use is unlikely to cause collateral damage to kids approaching that of adult use of “legal, regulated” alcohol and tobacco, but it clearly poses dangers that should be openly discussed. But don’t look for Newsom or his blue-ribbon commissions to go anywhere near true protect-children realities. The problem remains that because American adults don’t handle illegal drugs any more responsibly than legal drugs, criminalization may not prevent adult drug use from harming children and youth, and may even exacerbate harm. This reality is unsettling to raise in a political campaign, and I’ve heard from groups such as NORML and Marijuana Policy Project that a strong stand against teenage marijuana use is “good politics” (my paraphrasing). I disagree. Depicting marijuana as an apocalyptically dangerous drug that destroys an adolescent’s brain is both medically inaccurate and increases fear of marijuana, which can’t be “good politics.” In fact, the best, most recent long-term study by American Psychological Association researchers of 400 teen boys and their parents over 30 years found that even regular, early use of marijuana by teenagers did not lead to later psychosis, anxiety, depression, or health problems. The bottom line is that California decriminalized marijuana for teens, four years later teen crime, deaths, and other ills are down dramatically, and the reasoned conclusion is that youths can handle marijuana. It’s time to take marijuana-use decisions out of the hands of police and prosecutors and place it in the hands of individuals and families. So, yes, legalize marijuana. Instead of an age limit, set an “abuse limit” restricting the relatively small number whose behaviors show they can’t handle the drug. Maintain high taxes on legal drugs and ban drug use practices that cause secondhand harm to children. Cut out the “developing brain” foolishness (the “aging brain” is even more vulnerable) in favor of campaigns pointing out the consequences of heavy use for all ages and promoting moderation, which is not harmful for teens or adults. Don’t arrest people or take away college funding or demonize for non-harmful marijuana use, period. *Members included Keith Humphreys, Stanford Health Policy Associate who was senior policy analyst at the White House Office of National Drug Control Policy in 2009-2010; Erwin Chemerinsky, constitutional law expert and dean of the University of California, Irvine School of Law; Dr. Timmen Cermack and Dr. Peter Banys, both past presidents of the California Society of Addiction Medicine; Dr. Seth Ammerman, Stanford University professor and member of the American Academy of Pediatrics; Santa Clara County Sheriff Laurie Smith; and Sam Kamen, Denver University law professor.